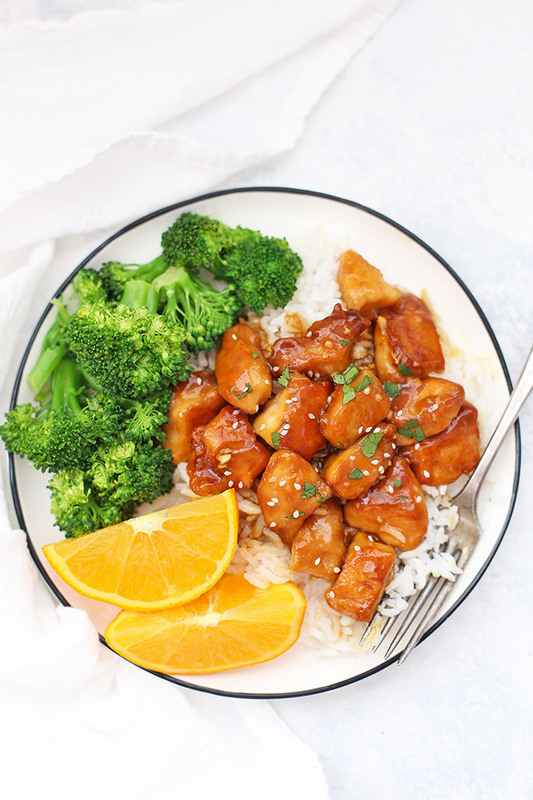 Healthy Orange Chicken – We can’t get enough of this lighter take on a takeout favorite! 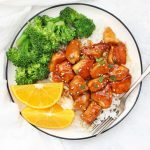 This orange chicken skips the deep-frying, has more protein AND it’s gluten free and paleo friendly! Gluten free eating sometimes means doing more from-scratch cooking. It’s things like making your own gravy or seasoning blends or pie crust. It’s figuring out how to make your own crispy chicken tenders instead of the frozen ones, or making gluten free stuffing for Thanksgiving. Other times, it’s as simple as a few no-fuss swaps. Like using gluten free tamari or coconut aminos instead of soy sauce, certified gluten free oats, or simply buying a bag of brown rice pasta instead of the white flour stuff. Those quick and easy recipes have become my (gluten free) bread and butter over the last (almost) 5 years. We eat a lot more simple meals than we used to, in large part because it saves time. When we spend more time in the kitchen cooking from scratch, any time savings really feels like it adds up. 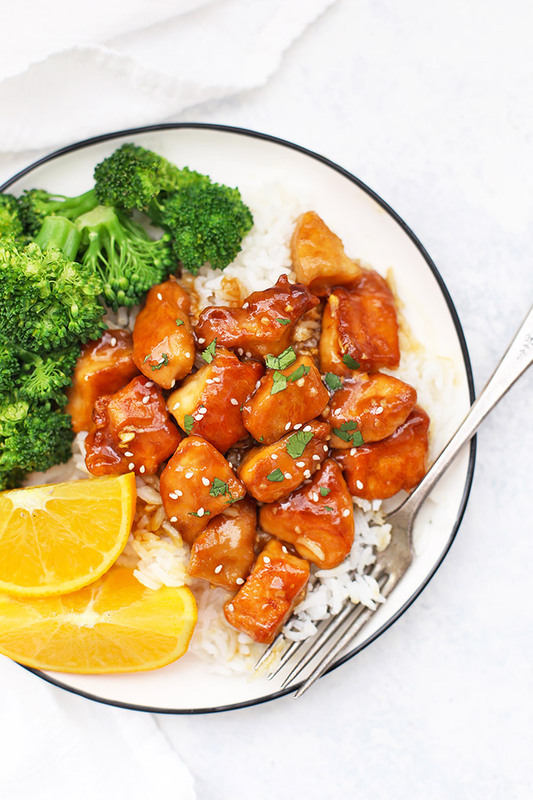 This healthy orange chicken is one of those “doesn’t taste gluten free” recipes that doesn’t involve a lot of extra work. It’s on the table in less than 30 minutes (whaaaat!?). It’s easily paleo and can be served on it’s own with a generous side of veggie stir fry or steamed veggies, or can be piled on a bed of rice or cauliflower rice. It’s got the flavors I love from our old take-out favorites and doesn’t involve a lot of extra work on my part to make it at home. So, basically? It’s a match made in heaven. The chicken is still crispy (even without deep frying) and the sauce is bright, tangy, and flavorful. It’s good enough to eat by the spoonful! So much so that my husband wants me to double the sauce next time so he can cover his veggies in it too. 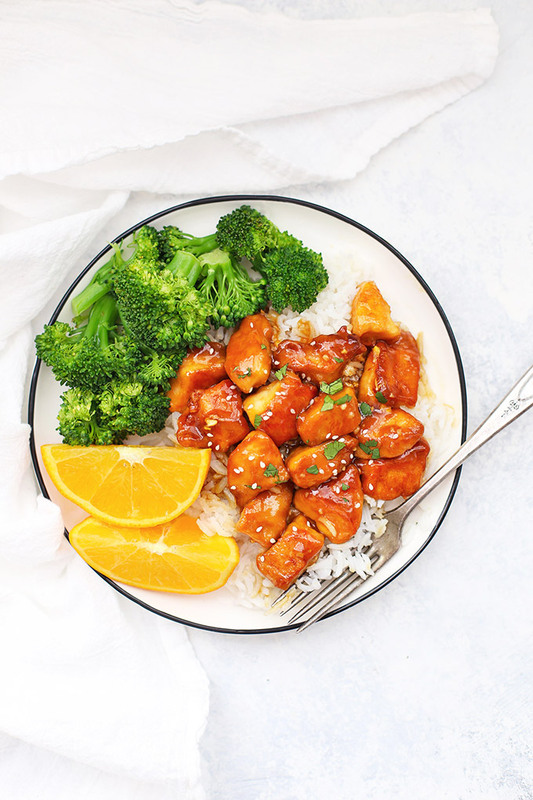 Whether you make this for a quick weeknight dinner or a cozy date night in, this healthy orange chicken is SURE to please! Paleo Notes – I’ve been able to get a good crispy coating using arrowroot (a grain free/paleo-friendly) thickener, but I do find that I REALLY need to keep the pieces of chicken from touching in the pan so they can get a good crispy sear. Arrowroot is also a little more finicky when it comes to thickening sauces. If it boils too long, it can actually lose it’s thinking powers, so as soon as your sauce thickens, be sure to turn off the heat and mix in your chicken. If it’s just not thickening, you can sometimes get away with adding a second round of arrowroot mixed with water. Lastly, you for sure want to use cider vinegar in place of the rice vinegar and coconut aminos in place of the GF Tamari or soy sauce. Cornstarch vs. Arrowroot – If you read the note above, you’ll know that arrowroot will absolutely work in this recipe, but it will be more finicky to work with. Cornstarch is REALLY reliable and will give you restaurant-quality sauce every time. If you avoid corn products or need a grain-free option, I suggest arrowroot. Veggies, Beef, and More – This orange sauce is SO GOOD you’ll want to eat it with a spoon. The sauce itself is vegan/vegetarian so if you’re looking for an awesome meatless meal one night, try this over veggie stir-fry. It’s AMAZING! Other (non-vegan) options are to use it over stir-fried beef or shrimp. Calling all sauce lovers! If you REALLY love extra sauce, you may want to 1.5 or double this sauce recipe so you have plenty leftover for drizzling over your veggies or mixing into your rice/cauli rice. As it’s written, there’s plenty to coat the chicken and some to soak into your rice/cauli rice. Got Leftovers? They reheat like a dream. I love packing them in meal prep containers with broccoli and rice/cauliflower rice for lunches! This recipe is absolutely DELICIOUS! It’s gluten free and easily paleo. See the notes for the simple swaps! PREPARE THE CHICKEN. In a large zip-top bag or a small bowl, combine chicken, cornstarch and tamari/soy sauce). Stir or mix until chicken is well coated. Mix up your sauce (see below), then heat avocado oil in a large pan over medium heat and cook chicken in batches, careful not to overcrowd the pan. Cook chicken 4-5 minutes on one side, then another 3-4 minutes on the second side, or until crisped and cooked through. Remove cooked chicken to a clean plate and repeat until all chicken is cooked. In a medium bowl, whisk together garlic, ginger, orange juice, vinegar, syrup, and tamari/soy sauce/aminos. In a small bowl, whisk together 1 Tbsp cornstarch with 1 Tbsp water. Set cornstarch mixture aside. When the chicken is done cooking, pour the sauce mixture into your pan. Whisk over medium heat until sauce thickens. Turn off heat and stir in cooked chicken to coat with sauce. PALEO NOTES – I’ve been able to get a good crispy coating using arrowroot (a grain free/paleo-friendly) thickener, but I do find that I REALLY need to keep the pieces of chicken from touching in the pan so they can get a good crispy sear. Arrowroot is also a little more finicky when it comes to thickening sauces. If it boils too long, it can actually lose it’s thinking powers, so as soon as your sauce starts to thicken, be sure to take it off the heat and mix in your chicken. If it’s just not thickening, you can sometimes get away with adding a second round of arrowroot mixed with water. Lastly, you for sure want to use cider vinegar in place of the rice vinegar and coconut aminos in place of the GF tamari or soy sauce. CORNSTARCH VS ARROWROOT- If you read the note above, you’ll know that arrowroot will absolutely work in this recipe, but it will be more finicky to work with. Cornstarch is REALLY reliable and will give you restaurant-quality sauce every time. If you avoid corn products or need a grain-free option, I suggest arrowroot. IF NOT GLUTEN FREE/PALEO: You can absolutely use soy sauce. I recommend low-sodium. Making this as we speak! So excited to try it, and I know if it is from you it will be a winner!! Oh, I hope you LOVED it! YAY! I’m so glad to hear that!!! We’re making it again for Valentine’s Day, I think! Emily, I’m wondering, are those sesame seeds used as a garnish? I have some in the cupboard, so I could do that. If so, are they toasted or plain? Thanks for your reply. I ended up adding sesame seeds before serving. I added a little cayenne to the sauce (2-3 dashes). 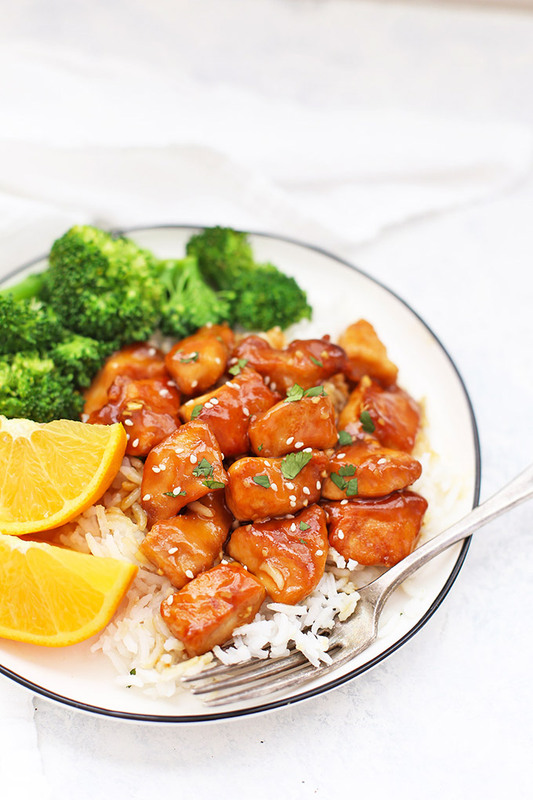 When we get takeout orange chicken, it’s mildly spicy and DH likes that. We’re empty-nesters, so we can go for the heat lol. This is a great recipe – easy and delicious! Thanks! Ooh! I’ll have to try that next time! Made this tonight and my very picky kids could not get enough! NO leftovers! 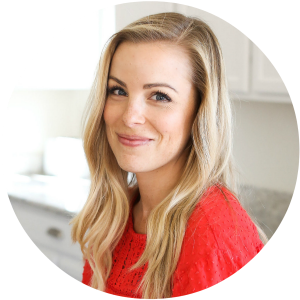 Thank you for your simple and easy to follow healthy recipes. Ive bookmarked a ton of them! Oh, that’s SUCH a huge win! It’s always so great when dinner is a hit with everyone!!! Made this for dinner tonight exactly as listed using corn starch. It was fabulous and my husband loved it!! YES! I’m so glad to hear that! It’s my husband’s favorite. The recipe calls for 1 pound of chicken but then the nutrition facts say that 1/4 recipe is a serving. So does that mean a quarter of a pound is the serving size? Seems small to feed my man! Melanie – I hear you! Serving sizes listed are estimates, based on different factors. The USDA serving size of chicken breast is often listed as 3-4oz per serving, which is part of why I state that this recipe is 4 servings. How many “servings” a person needs totally depends on other factors too–age, gender, size, shape, metabolism, fitness goals, dietary needs, etc., so your husband may absolutely need 1.5-2 servings of this dish depending on those factors. For instance, a petite adult female who is moderately active with walking and yoga likely won’t need the same “serving” size as a 6 foot 5 man who does marathon running and power lifting. Consider this a range 🙂 I hope that helps!